I’ve spent most of today being constantly confused by any reference to the word “leap” or the number “29”. It started last night with a 29 hour sale at a retailer I use. This morning, another retailer was offering 29% off. I opened Timehop and was staggered that there was a day I hadn’t actively used social media in the last 4 years, and couldn’t understand that anomaly. My confusion was briefly interrupted when I was informed that my favourite place for brunch had no pancake mix left. 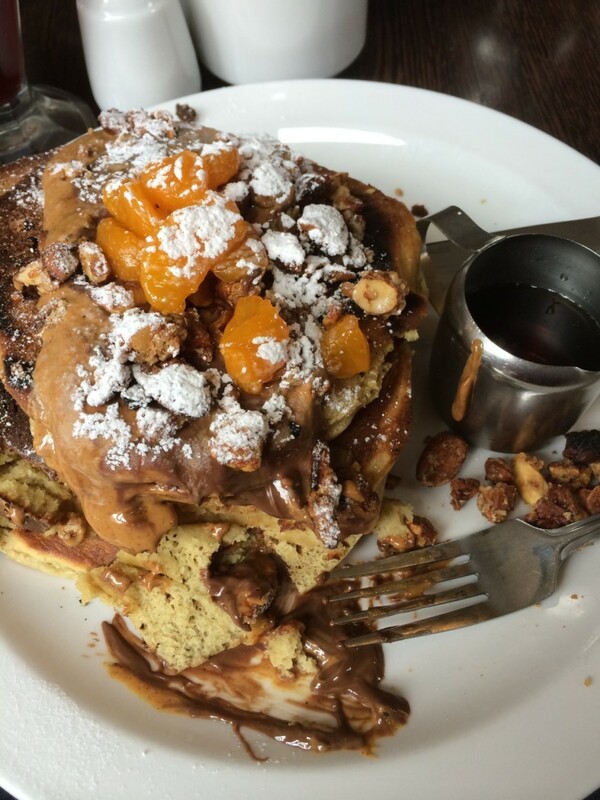 No granola, peanut butter and chocolate pancakes topped with orange pieces and served with maple syrup. I mitigated my disappointment with french toast with bacon and lots of syrup, and the wholly unnecessary purchase of an iPad Pro. Moo is grateful for another white charging cable to play with. Days off are expensive for me! The sadly AWOL pancakes I was hoping for. The second would be how we don’t get paid for that time at work. Yes to 29th February being a Leap Year Public Holiday everywhere! The third thing, I’m guessing, would be peoples’ girlfriends proposing to them. I think I probably have more hope of a successful 14th March than my dream woman telling me that she wants to spend the rest of her life with me, but she still has some time today! I had a friend who did this. He worked away from home on a 6 week on / 6 week off cycle. She sneaked a ring into his bag (hidden at the bottom) and proposed over satellite phone with its not so useful delay. He said yes with a hint of disappointment that he would, sooner or later, have made the leap himself. And that leads me onto the fourth idea. Taking a leap. I’ve covered my aversion to risk on a few posts recently. To summarise for new readers – I don’t like taking risks. I like to have as much information as possible, and like to be able to make up the shortfall of knowledge with gut feeling. If Brain and Gut don’t get far enough, I won’t do it where the risk of loss is greater than the risk of gain, whatever Heart says. So… I started thinking about more literal translations of leap. Yesterday I spent the day at Wembley, watching Liverpool lose on penalties to Manchester City in the Capital One Cup Final. My recurring back injury has recurred so spending 4 hours sat in a car, followed by around 7 hours of standing and another 4 hours of sitting did it no good whatsoever. What also hurts it is jumping. I’d done well to avoid jumping, helped by Liverpool’s inability to have a shot on target. 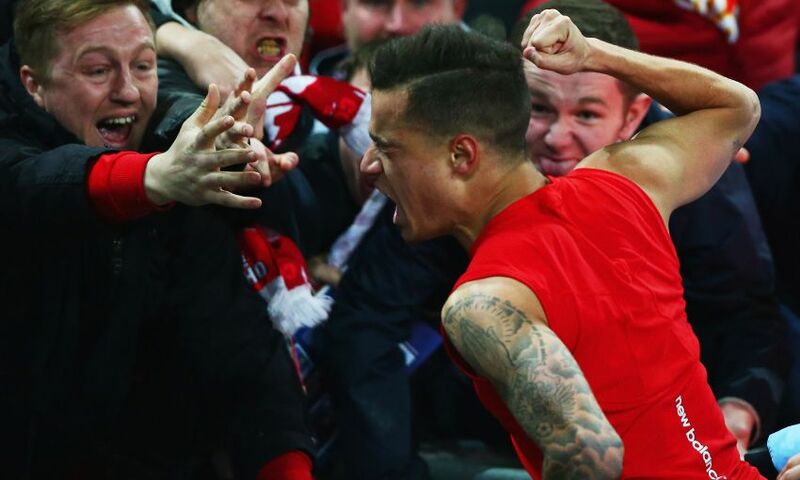 That was until Phillipe Coutinho scored an equaliser and my reactions took over, causing me to jump for joy. There was one jump, quickly followed (on landing) by an ouch, a wince and then trying to restart the celebrations. I knew I didn’t want to leap, but did it anyway without thinking! Look how red Phil’s ear is! I also remembered, on the subject of leaping, about an instance in PE at school. We were very much a football (soccer, for everyone outside Europe) school but in the summer we played cricket and did athletics. The cricket team was made up of the only 11 of us who actually wanted to play and didn’t hurt ourselves taking a cricket ball in the mouth, but that’s a not-so-long story for another post. The athletics team was actually selected based on performance in PE lessons. One day we did triple jump. I’m still not good at power sports – I’m far better at keeping going than going hard (minds, gutter, but yes, sometimes it can be a benefit!) – so I feel a little harsh for telling the story, but one guy was not really built for sports at all. He ran down the runway in one of those runs where one actually moves faster and a damned sight more efficiently by actually walking. He hit the board and took three more steps in exiting the runway without actually ever making the sandpit. There was no real leap involved. In fact, just before I turn this back in to a metaphor, I’ve thought of another “leap” and PE related story of when someone was trampolining, jumped on to her front and got her nose stuck in the mesh of the trampoline bed. I shouldn’t laugh, but given how much everyone laughed at me and my “awkward” fall not-quite-off a balance beam (use your imaginations about how a guy could fall painfully on a balance beam but not strictly off it) I’m not so sure how guilty I feel. So, back to the metaphor. Some people take the leap despite not really wanting to (and it hurts). Some people try to take the leap, but it’s not overly successful. On what basis do you judge taking a Leap of Faith yourself? Inspired by today, and today’s one word prompt “Leap“. Very nice read! Who is Moo? 🙂 And thank you for getting Van Halen stuck in my head, love it! BTW, for back problems (speaking as a person who has a disc and scoliosis), please try Pilates, it changed my life! There is a great instructor in the UK called Lynne Robinson; she fixed me! I actually had to cancel my gym / pilates induction when my back went again. It is on the agenda and I’ll check out that name. Thanks!